Rwanda’s telecommunications market is in a state of active development due to steady growth of GDP. Thanks to foreign aid, favorable conditions were created for the telecommunications business, which made it attractive for investors. The country is doing well in the mobile communications sector, but what is the situation with the Internet services market? Our review will help you understand if the Internet in Rwanda is suitable for profitable VoIP termination. 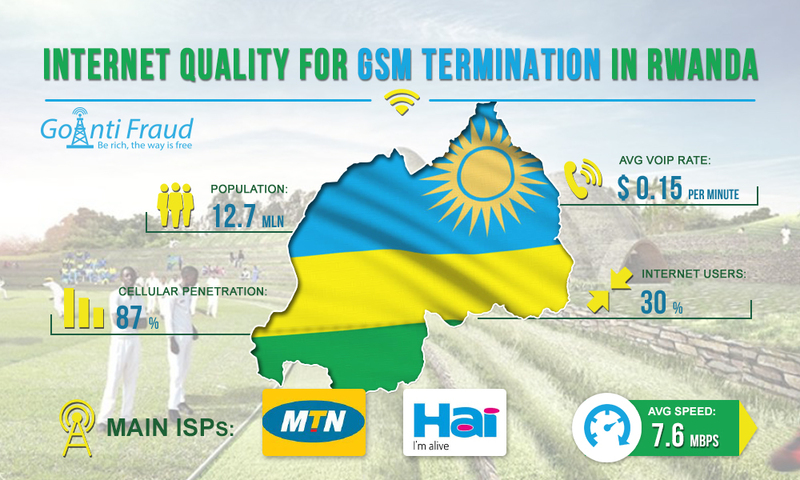 The broadband access segment development in Rwanda is limited by the poor state of fixed-line infrastructure and rather high tariffs for services. However, there are positive trends as well, for example, the deployment of fiber-optic mains. They provide local Internet providers with an opportunity to connect to international submarine fiber optic cables in the east of the continent. Liquid Telecom, a popular provider, is actively expanding its fiber-optic Internet access services throughout Rwanda. Another major Internet service provider in the country is MTN Rwanda. The average data transfer rate over the Internet is 7.6 Mbps. This is an excellent indicator for an African country. For the smooth operation of gsm sms gateway hardware, the minimum required speed is 5 Mbps. The best option for termination is the fiber-optic Internet, the access to which is provided in Rwanda. In landing traffic, the stability of the Internet connection is important and FttP connections are considered the most reliable. If you do not have enough speed for profitable voice termination, use GoAntiFraud SBO software module, which improves the network bandwidth.